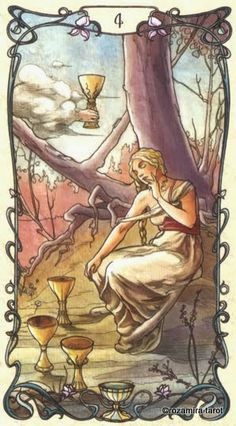 It’s the 33rd week of the year and the card of the week is the 8 of Swords. You may be feeling like you’ve been a prisoner, bound and held captive due to things that have happened that are out of your control. But this week is going to change all of that as Saturn prepares to station direct on Saturday. You have the choice to remove the blindfold and see the lessons that you lived that you prepared for yourself before you were born. It’s time to awaken, are you ready? The number of the week is 6, a number of clarity. Mantra: I have a choice to stay in the darkness, or I can choose the light. 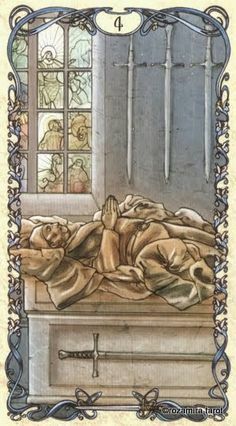 The Four of Swords appears when you need to take stop, rest and recover. If you’ve been under a considerable amount of stress or you’re not feeling well physically, this card encourages you to give yourself the down time you need. Moon sextile Saturn at 5:19 AM PST will help you accept that it’s time to relax if you’ve been in go, go, go mode. But it may be hard to not worry about what needs to be done with Mercury opposition Neptune at 9:25 AM PST. Put the rapidly cycling thoughts aside and free yourself from worry. Moon square Pluto at 4:38 PM PST could leave you feeling compulsive. If you really feel the need to do something new, do something relaxing like trying a new restaurant or exploring a new area of town. Moon sextile Sun at 5:29 PM PST brings happiness, harmony and flow to your evening. With all the good vibes you soaked up today, you’ll be feeling recharged by the end of the day. The Moon is in the balanced sign of Libra, reminding us that a little bit of down time is needed to get back to the center. The number of the day is 6, reminding us that taking a rest is sometimes what we need to come out on top. 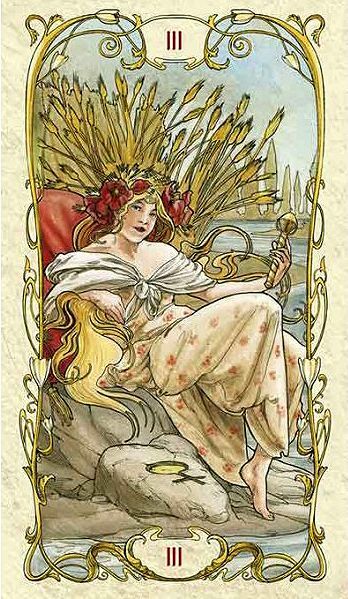 Your body may feel refreshed after your day of rest yesterday, but the appearance of the 4 of Cups suggests that your mind may still be turned deep within. If your mind needs additional rest, trun to meditation. But don’t retreat so far within that you forget what is being offered to you in the mundane world. Moon opposition Neptune will give you the clarity you need to be truthful with yourself about issues at hand. The Moon is void of course between 10:41 AM PST and 9:51 PM PST when it enters Scorpio, enforcing the fact that once again, today is a day to take it easy and let things come and go as they please. The number of the day is 7, a number of reassessment and reevaluation. Mantra: There is a universe waiting to be discovered within us. Be silent and listen. 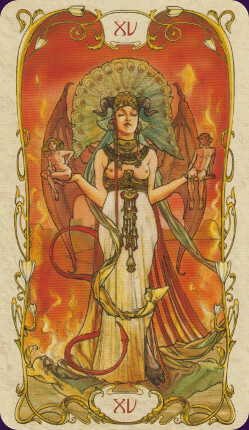 The Venus ruled Empress appears when we are experiencing a time of blessings and abundance. Take time today to enjoy all that you have. Treat yourself to the luxuries of life and be thankful for everything you’ve earned for yourself. Moon sextile Venus at 7:34 AM PST will bring love and beauty to your morning. Moon trine Neptune at 8:38 PM PST will heighten your intuition and show you how to give and receive love from others. The Moon is in the passionate sign of Scorpio will only deepen the ways in which you experience love today. The number of the day is 8, a number of strength and accomplishment. Mantra: Pour love into something and watch it grow. As we’ve progressed through the week, we’ve given ourselves the space to rest and through that, we’ve been able to step back and enjoy the gifts we’ve received in our life. Since it’s first harvest season, we’ve been given the insight to look at the yield, be thankful for it and enjoy it. Now that we’re feeling good about ourselves and we’re clear on our vision, we now have the ability to envision what we want to harvest by Fall Equinox. And the message from the Empress from yesterday is clear, pour love into your dreams and watch them grow. 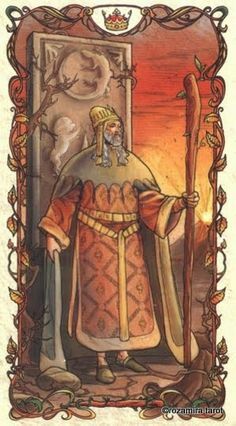 If you’re still having a hard time grasping your vision, the King of Wands may a manifestor represent someone with traditionally masculine energy appearing in your life to show you the way. Moon sextile Mercury at 3:47 AM PST will find communication flowing freely. If you’re asleep during this time, look for messages that may show up in your dreams. Moon sextile Pluto at 5:05 AM PST may bring hidden feelings into the light. Moon square Sun at 11:21 AM PST will find your intentions you set at New Moon being challenged. Mercury trine Pluto at 4:23 PM PST will help you discover hidden truths about yourself. Moon sextile Jupiter at 10:22 PM PST will leave you finishing off the evening with an optimistic attitude. It’s first quarter in Scorpio any challenges to your goals may sting quite a bit. Don’t give up because the number of the day is 9, a number of near completion. You may be feeling empowered and ready to take on the world. The burst of energy and passion is wonderful for propelling you past the obstacles of first quarter but make sure to pace yourself. Moon conjunct Mars at 6:04 PM PST could grace you with tremendous energy that leads to bravery and courage. If you’re feeling like things are getting a little too “hot”, do some kind of physical activity, like exercise, to help bring yourself back into focus. The Moon is void of course until She enters Sagittarius at 10:24 AM PST where She will stay for the rest of the day. When the Moon is in the fiery sign Sagittarius, people generally feel energetic and optimistic. The number of the day is 1(0), a number of new beginnings. The Devil is a trickster; don’t get caught in his wed of lies. Moon square Venus at 2:58 AM PST may make it difficult for you to express love. If you’re struggling with this, consider how you express love to yourself. You may feel tempted to get down on yourself with Moon conjunct Saturn at 5:51 AM PST but remember that you are a strong, capable person who can do anything you put your mind to. Moon square Neptune at 8:39 AM PST may throw your perception off, so make sure to go over all the details before jumping to conclusions about anything. Moon square Mercury at 9:59 PM PST may muddle communication. This is a good time to retreat and spend a quiet evening by yourself. 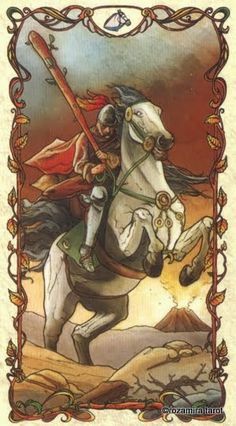 You may feel restless with the Moon in Sagittarius for most of the day so do something to release that pint up energy. The number of the day is 2, reminding us that all things need balance. 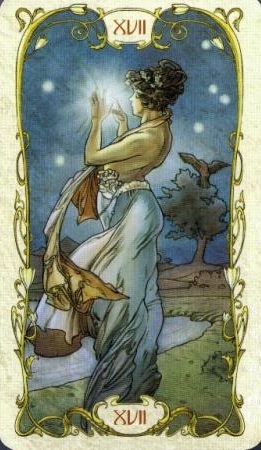 The Star is a card of renewed hope and freedom. Saturn stations direct today at 2:51 AM PST. The Star card is a good omen for this planetary shift. It reminds us that we’ve graduated from the hard lessons the teacher planet has dealt over the past five months and things will be easier from here on out. Moon trine Sun at 4:05 AM PST will bring happiness, harmony and flow to your early morning. Venus square Saturn at 7:31 AM PST could cause extreme mood swings. Be realistic and try to approach things pragmatically. Moon trine Uranus at 10:28 AM PST will bring new and exciting changes. Moon square Jupiter at 10:37 AM PST could leave you feeling egotistical and arrogant. Remember that no one is better than anyone else. THe Moon is in Sagittarius until it goes void of course at 10:37 AM PST. Then it will enter Capricorn at 9”11 PM PST. When all is said and done today, ask yourself what you’ve learned over the past five months. The number of the day is 3, a number that reminds us that all the trials we’ve experienced will start to make sense now that we’ve overcome them. Mantra: Life is the greatest teacher of them all. This entry was posted in art, Books, dreams, mysticism, mythology, numerology, occult, Qabalah, Runes, self help, spirituality, Tarot, Uncategorized, witchy, Writing and tagged abundance, astrology, card a day, divination, dreams, empowerment, inspirational, magick, manifestation, mantra, meditation, metaphysical, motivational, numerology, occult, pagan, predictions, psychic, self help, spiritual, tarot, tarot reading, tarot weekly forecast, wicca, witchcraft, witchy, writing. Bookmark the permalink.